With respect to education, chess has been shown to raise individuals’ intelligence quotient (IQ) scores, enhance academic performance in reading and mathematics, and strengthen problem solving, critical-thinking, and decision-making skills. Additionally, chess improves concentration and memory, develops logical thinking, and promotes creativity. The educational benefits of chess are perhaps the most widely researched area of chess. regarding the various benefits of chess in education. In the research literature as reviewed by Ferguson (1995), in a study conducted by Dr. Albert Frank, chess players compared to a control group were found to demonstrate significant advancement in verbal, spatial, numerical, and administrative-directional abilities. In a study in the 1970s in Belgium, chess players were found to perform significantly better in regular school testing as well as in standardized testing. In another 1970s study conducted by Dr. Yee Wang Fung of the Chinese University in Hong Kong, chess players showed a 15% improvement in math and science test scores. Additionally, researchers conducting a study in the late 1980s in rural Pennsylvania found that students required to participate in chess lessons and games significantly improved in memory and verbal reasoning. Scientists conducting research in the 1990s in New York City Schools found statistically significant results which concluded that chess participation enhances reading performance ( Ferguson, 1995). The aforementioned research studies are only a small subset of those which provide evidence for the various educational benefits of chess. The cause of this educational growth as a result of chess instruction and participation is not yet clear. Many researchers speculate that this educational improvement might be the result of the growth and development of new synaptic connections in the brain (Ferguson, 1995). As it is largely an individual activity, chess fosters independence and personal growth. Chess players learn quickly that in this game, they are forced to make crucial decisions influenced by only their own judgment and thought processes. Chess also inspires a sense of confidence and increases self-esteem. 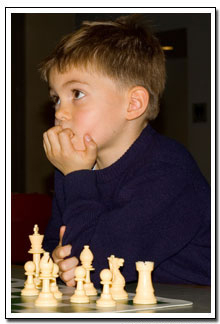 As an individual encounters success in chess, he or she realizes that the success can only be attributed to his or her own decisions and hard work. According to a study conducted in the 1980s, chess consistently promotes self-esteem after a year of exposure and improves students’ self-images dramatically (Ferguson, 1995). When individuals compete together as chess teams against other teams, chess can foster team work skills, team pride, and a subsequent sense of identity.